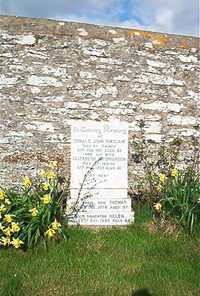 Donald John Sinclair died at Swiney 21st February 1931 aged 53. Wife Elizabeth Macpherson died at Irvine 6th March 1965 aged 81. Son Thomas Sinclair died 7th December 1976 aged 57. Daughter Helen Sinclair died 20th October 1999 aged 85.